Group counseling and peer led sessions encouraging self-expression and compassionate listening. The catalyst for Inner Fire was a thirty-eight year old man named Zach, who while struggling with mental health challenges, tragically took his own life. Zach did not know he had a choice to recover free from the harmful and stultifying side effects of psychotropic medications. Instead of connecting with his inner fire using proven holistic therapies, Zach chose to end his suffering amidst a fog of pain. Zach is but one of a multitude who gave up hope because he experienced no progress toward healing and no other choice for recovery was evident. 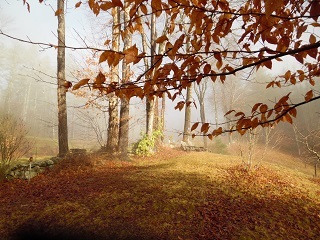 While working together at a treatment center in Vermont serving adults with serious psychiatric and addictive challenges, Beatrice Birch, a Hauschka Artistic Therapist and Jim Taggart, then Executive Director of the center, were distressed by the limited and often counter-productive treatment options for people like Zach. From Beatrice’s thirty years combined experience working in clinics, rehabilitation centers and her private practice in the US, UK and Holland, she knew options needed to be offered for those who wanted to be proactive in their recovery process. Many residents with whom Beatrice and Jim worked were resistant to taking their medications and detested the way the drugs made them feel. Typically, the medication confused their thought processes, disconnected them from their feelings, and sapped them of their willpower. Beatrice and Jim also experienced the tragedy of untimely deaths of individuals due to medical complications associated with long term neuroleptic use. They recognized that traumatic, biographical experiences left deep impressions on the soul and that the addictive medications, which dull the symptoms, serve simply to avoid the real work of dealing with the effects of the trauma. In addition, the medications not only confused the issue at hand through their side effects, but caused additional trauma by the difficult process of withdrawal. The majority of individuals they knew were unable to achieve genuine, social integration or to generate income other than through disability checks. There is a growing body of research in the U.S. and abroad regarding the harmful effects of the ever-increasing reliance on psychotropic drugs to treat psychiatric disorders.¹ Meetings and discussions with other professionals confronting many of these same issues reaffirmed Beatrice and Jim’s commitment to offering a choice to those seeking a proactive engagement in their healing process. Inner Fire, Inc. is a unique, intentional program based on years of applied experience. Its name exemplifies the reality that only by rekindling and claiming our inner fire can balance and healing occur. The yearlong program facilitates a comprehensive, healing process by offering empowering opportunities through proactive individual and group therapies, a customized work program, a wholesome diet and nurturing, cultural experiences, which together with peer support, helps to rebalance and bring harmony to the distressed soul. In 2012, Tom Kavet, an economist and public policy expert with healthcare experience, joined with Beatrice and Jim to serve on the initial Board of Directors and further develop the conceptual framework, budget, funding and program model. 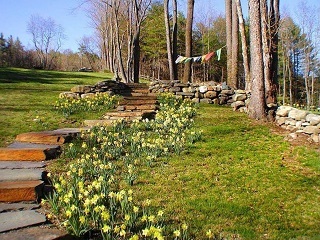 They purchased a beautiful property in Brookline, Vermont which is now the home for Inner Fire. 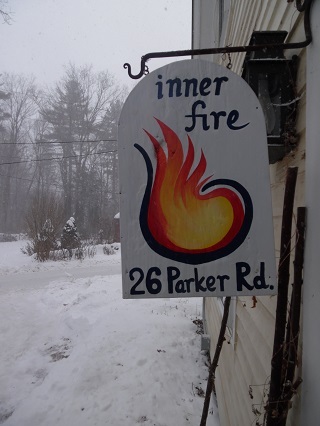 Inner Fire is a tax-exempt 501(c)3 organization, incorporated in Vermont as a not-for-profit entity in September of 2012. Beatrice, Jim and Tom are committed to shared beliefs and values that guide Inner Fire. The primary belief that human beings are creators rather than victims is foundational. Because of this reality, individual proactivity is essential. Such proactivity leads to a sense of empowerment, which in turn will lead to a renewed enthusiasm for life. From this stems the recognition of the therapeutic value of physical, outdoor, communal work, as well as individual and group therapies which would encourage soul/spiritual growth and a reverence for life. Inner Fire values beauty, as reflected in the buildings and grounds, which in turn feeds the soul, and an organic and balanced diet, which feeds the body. An experienced and dedicated, professional staff who are committed to facilitating the healing process through respectful, holistic, high quality care for the participants is essential. All staff are committed to developing insights and learning through their research and observation and to sharing their experiences. Finally, the Board believes that support in one’s healing process should be a right rather than a privilege and that, therefore, Inner Fire needs to be available to individuals regardless of their financial status. Individuals from the age of eighteen, who want to be proactively engaged in their recovery without the use of psychotropic medications, are encouraged to apply to Inner Fire. This includes those experiencing a first time “break” as well as those who desire assistance in coming off their medications. Inner Fire aims to be available to as many individuals as possible, regardless of their financial situation and will be a place where people of all races, cultures and religious beliefs can meet and support each other in their deepest humanity, as they strive together for a depth of inner healing and balance. Attendees at Inner Fire are called “seekers,” recognizing that both they and professional staff at Inner Fire (referred to as “guides”) are all striving individuals seeking balance, purpose and greater meaning in life. 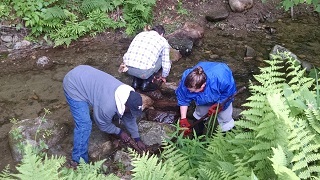 During the mornings, individuals participate in an intentional work program in the gardens, woods, kitchen or household. Two afternoons a week they engage in creative and supportive group sessions, including HVN (hearing voices network) and other peer-run initiatives. The other three afternoons offer an appropriate personal therapy such as artistic, music, eurythmy, spatial dynamics, massage, holistic nursing and/or biographical counseling. Our experienced staff, therapists, medical doctor, homeopath and psychiatrist pool their expertise during weekly meetings focusing on each individual’s progress. Evenings and weekends consist of planned social fiber-building activities and creative, cultural events aimed at nourishing the soul and experiencing the richness of nature. 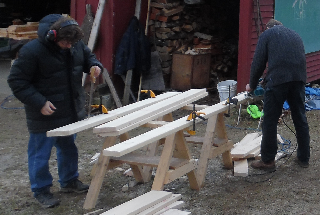 Toward the completion of an individual’s year, the option of receiving help in finding meaningful employment opportunities or to apprentice with a local crafts or tradesperson is offered. The individual may also maintain a connection with his or her mentor at Inner Fire, who will continue to support the inner growth – which comes naturally with a dynamic life. Achieving the Inner Fire’s mission requires significant resource development. The challenge is developing a sustainable economic foundation and construct that can support the retention of a superior staff and deliver substantive results. Therefore, the economic plan supporting Inner Fire is characterized by diversification and growth. The diversification includes an initial funding model based on a combination of private fees, government funding sources, insurance, individual and business donations, grants, and volunteerism. 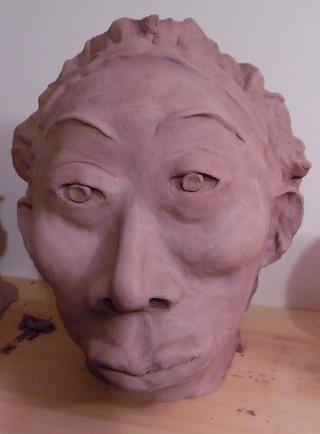 To complete this work, Inner Fire is reliant on continued generous support from private donors and foundations. Fundraising is still instrumental for financing both start-up expenses and creating the Inner Fire Endowment. The full evolution of the Inner Fire model, however, aims to fund all operations from a robust endowment, allowing program participation based solely on need, with donations by participants encouraged to advance and spread the development of this treatment option to other locations in the United States and beyond. With the generous support of families, professionals, advocates and friends, we are committed to both the hard work and exciting prospect of building a residential community that honors our humanity and seeks recovery beyond medications. This initiative aims to save and change lives by offering an extraordinary program that recognizes the creative power of the inner fire of individuals daring to claim and transform the pain which has led to addiction and mental health challenges. For more information, please contact Beatrice@innerfire.us. See, for example, Robert Whitaker, The Anatomy of an Epidemic, (New York: Random House, 2010); articles and analysis compiled by The Foundation for Excellence in Mental Health at: http://femhc.org; and topical issues and analysis discussed on the blog: www.madinamerica.org.